Happy September and welcome back to school! This is certainly an exciting time of year – new friends, new teachers, and LOTS of new things to learn! I am thinking about our little ones this month. Often children are so excited about all the “new” around them that it takes a few days or even a few weeks to settle down, sit down and do written desk work. For that reason, I think it is helpful to “sneak” learning into activities that feel more like play. Children naturally learn through play – so let’s harness that ability and use it to our advantage! 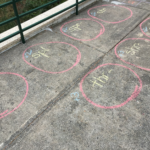 Sidewalk chalk provides endless creative options and is a perfect inexpensive resource for multi-modality learning! I love it for all of my students – it’s great for kids from kindergarten through fifth grade and beyond. Very young students can practice writing large letters and are not confined to lines on paper. I find this to be helpful and comforting when fine motor skills are not fully developed. There is also a kinesthetic/tactile quality about writing with chalk that is great for learners of all ages. Kids really “feel” what they are writing on bumpy, rough sidewalks. They are forced to slow down and intentionally form each letter. 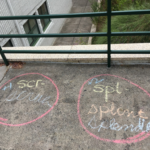 Using sidewalk chalk can be a helpful strategy as we work to move concepts from short term to long term memory – plus, it is tons of fun! 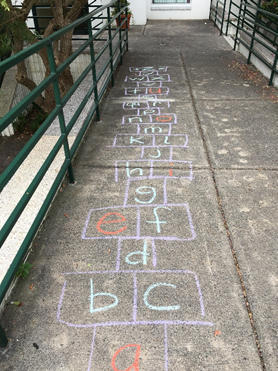 Here a few suggestions of ways to use sidewalk chalk to help develop phonemic awareness and letter-sound correspondence. I have also included “Cluster Buster”, a game I developed to review and reinforce consonant clusters. 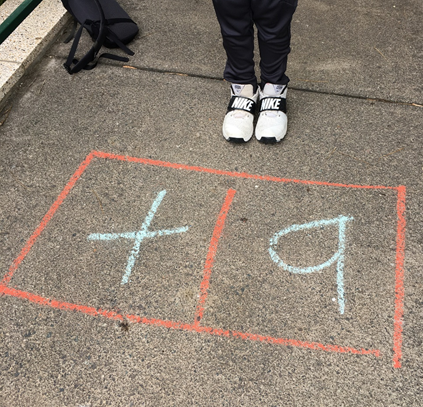 Draw a hopscotch grid with the alphabet. Make vowels orange and consonants green. I color code letters as often as possible because it is important for students to begin to notice the difference between vowels and consonants. Students will be better spellers if they begin to pick up on the vowel-consonant letter patterns in words. If your students are young and have not learned the entire alphabet, shorten the grid and only use the letters that they know. Make sure kids only hop in the direction from a to z. Hopping backwards through the grid is not helpful since we are working to solidify the alphabet sequence. Hop through the board saying letter names, but touch the ground or clap when you land on a vowel. Give students a category such as animals (alligator, bear, cougar, deer, elephant, fox…) which helps build vocabulary and provides practice with word retrieval. Hop through the board stepping only on consonants. Hop through the board stepping only on vowels. Let students make their own grid so they can practice writing letters. Make sure they differentiate between vowels and consonants. If they need more challenge, make a square with 4 boxes to increase the number of consonants that they are practicing. Letter boxes can also be used as a way to practice initial blends. To provide variety, you can let kids jump in a box and think of their own word that starts with that sound. You can also have a deck of cards with words and let one student pick a card and read the word, while the other student jumps to the correct box. 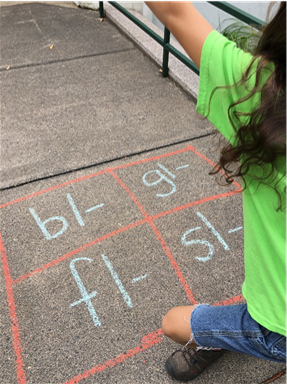 Hope these ideas are helpful and remember, you can always practice writing spelling words outside in chalk. If mistakes are made, just cross through the word – no need to erase it. It is helpful to see mistakes and learn from them. It is ok to even misspell a word multiple times. I celebrate every mistake as a great opportunity to learn. That’s when you know you are making progress!